Explanation: On January 3, the Chinese Chang'e-4 spacecraft made the first successful landing on the Moon's farside. Taken by a camera on board the lander, this image is from the landing site inside Von Karman crater. It shows the desksized, six-wheeled Yutu 2 (Jade Rabbit 2) rover as it rolled down lander ramps and across the surface near local sunrise and the start of the two week long lunar day. Ripe for exploration, Von Karman crater itself is 186 kilometers in diameter. It lies within the Moon's old and deep South Pole-Aitken impact basin with some of the most ancient and least understood lunar terrains. To bridge communications from the normally hidden hemisphere of the Moon, China launched a relay satellite, Queqiao, in May of 2018 in to an orbit beyond the lunar farside. Kudos to China! common US you can do it too! Wondering if China should have naming rights. Good to see the rover on the surface. I hope the Chinese the science they find in real time. I am impressed with the landing, but given the crater 'right outside the garage door', things could have gone differently. Nature has a way of interfering sometime. But the Chinese have demonstrated excellent planning, engineering and the benefits of the luck of the universe. An amazing thing to have done. But in looking at the photo, and given the terrain the rover will travail, are the wheels of the rover sized large enough? Still 'Bravo Zulu' (a naval military reference) to all involved, and name whatever you find. It is the right of the discoverer to do so. <<The Moon is remarkable for the variety and unusual nature of the names of its surface features. The dark, smooth maria are named for weather or states of mind (Sea of Rains, Sea of Tranquility) while many of the abundant craters of the Moon are named for famous scientists, philosophers, mathematicians and explorers. Before the advent of the space age, only the near side of the Moon was visible, although most scientists believed that the far side probably looked exactly like the one facing Earth. (How wrong they were!) Naturally, once we had the ability to see uncharted lunar territory, a new era of name assignment commenced. But even now, many lunar craters and features await something more than mere coordinates. The drawings by Galileo of the Moon in 1610 show craters and mountain ranges but he did not assign names to them. As telescopes improved, revealing finer surface details, several maps appeared with names bestowed by their astronomer authors to flatter patrons or express their nationalism. Most of those early names have been forgotten to history. In 1651, an influential map by Jesuit astronomers Grimaldi and Riccioli became the foundation for the official naming reference guide that we use today. With the flight of the Luna 3 probe in 1959, the Soviet Union was the first nation to image the far side of the Moon. To the surprise of most, large regions of maria (so prominent on the near side) were mostly missing from the far side. Although the first images were of very low quality, the Soviets couldn’t resist the urge to name newly discovered features for a variety of Russian heroes and place names, such as Tsiolkovsky and the Sea of Moscow. Some new “features” were misidentified because of the low resolution – the name “Soviet Mountains” (no longer used) was given to a bright linear streak across the far side globe (a feature that turned out to be a long ray from the fresh crater Giordano Bruno and not a mountain range). How big is that small impact crater just off the lander ramp I wonder. I wonder if the caked lunar dust is thick enough so it would soften the impact of the asteroid? It might still be intact. This is an outstanding accomplishment for any space program. When objects hit at kilometers per second (which everything does on the Moon) there's not a lot of difference between hitting regolith and hitting rock in terms of the impactor itself (it does effect crater morphology somewhat). On Earth you can get impact pits, because the body can be slowed down to a few hundred meters per second or less, but not on the Moon. Pretty much every impact will be a cratering event, and except for very massive impactors, will probably vaporize the impacting body. The image was made with the Terrain Camera (TCAM) on the lander. That camera uses a CMOS sensor with a Bayer filter array... that is, pretty much a standard color sensor like you'd find in any camera. So the image is "true color". Of course, that's not to say it has been through whatever full processing workflow is utilized to calibrate color. But it is an RGB image, not a monochrome image case into a range of reds. On the reporting of this historic mission I've been appalled by how often this landing has been said to have been made on the so called "Dark side of the Moon"! I mean, can't they SEE that it's sitting in full sunlight? How doorknob dumb can you get? And, this hasn't been just local yokels either, national news outlets have also repeatedly made this gaff. Dark means unknown in this context. Unknown things often seem gloomy. It is not meant literally but as a metaphor. Occasionally, maybe. But usually it's just a stupid slip, a combination of ignorance and falling into a common English phrase that simply doesn't apply. APODFORIST is being quite charitable. Many of these pretty faced reporters wouldn't know what a metaphor is. com'mon US you can do it too! But seriously, it does look too red. Maybe it's to honor the Communist Party? "I told you to pull over and ask for directions, but NOOOoooo..."
Go for it little rover...Ding HAO!!! Congratulations to the whole team of explorers! 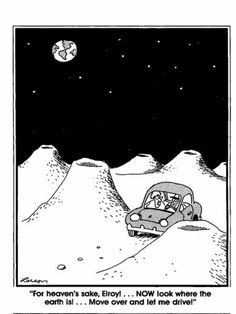 The Russians were the first to SEE the far side of the moon. The Chinese are now the first to LAND on the far side of the moon. Who will be the first to STROLL on the far side of the moon? The Chinese Workers' and Peasants' Red Army was created on May 25, 1928, at the beginning of the Chinese Civil War. Between 1934 and 1935, the Red Army survived several campaigns against the Nationalist forces who were led by the Generalissimo Chiang Kai-shek and engaged in the Long March. Quite a lot of signal on the other channels, actually. For some reason they never bothered to include the other channels to produce a typical grey lunar landscape. Grey isn't really their color. 1936-03-23: SHANSI EXTRA World Flash et By United Press. Protection For China American educators and missionaries and their families sought refuge here or Inside the city walls of Taiku and Fenchow today from a Communistic army advancing through Khans province to the west General Yen has answered a request of the American Embassy for protection of missionaries by promising that he will see that they reach safety in towns in the Red armys path Newspapers report that the Communists have surrounded him. leased by them and was repatriated on the first trip of the S. S. Gripsholm. She was returning to China in 1944 when she died in Calcutta, India. I'm curious about more pictures. Does anyone know a page - maybe a Chinese one - where you can see more current pictures? So far I've only seen another picture where the rover took a slight right turn towards the crater. I wonder if you really intended this to sound as sexist as it does. I bet they know what a metaphor is, and they also know how to communicate ideas in a way that the public understands, even if it's a misnomer. Even if they are wrong, calling people stupid is a really awful way to go about sci-com and astronomy education.